"Few left so buy early for Christmas gift!" 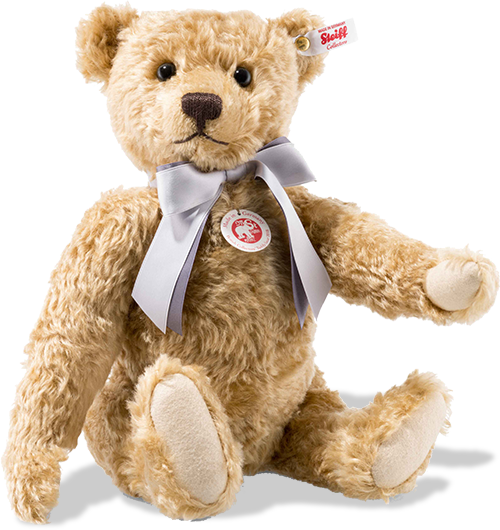 Steiff British Collectors Bear 2018 - the famous traditional limited edition bear all our collectors have been waiting for. A special gift to celebrate the year of 2018, anniversaries, christenings, Christmas..........or just for the one you love. He is designed by Steiff and is made from superb wavy cinnamon mohair and is fully jointed (which means his arms, legs and head are moveable) and his paw pads are made from felt in a gentle beige colour. A teddy bear with a face full of character with sweet little ears, hand embroidered brown nose and mouth together with large black eyes. And just turn him over and he will give you the famous Steiff bear tradtionial growl. A real collectors piece and a Limited Edition of just 2,000 pieces.